From its very early days, one of the core appeals of online real-estate marketplace Zillow has been looking up your house (or your neighbor’s, or anyone else’s) on a digital map to see how much it might be worth. “For us, really more than any other app in the category, we start with a map. And we think location is super-important,” says Jeremy Wacksman, Zillow’s senior director of marketing and mobile strategy. 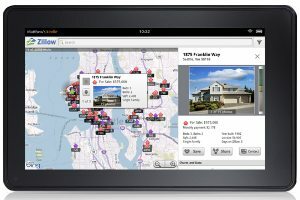 So when uber-retailer Amazon.com came out with the Kindle Fire, Zillow (NASDAQ: Z) needed to find a way to include mapping with its app for the new entry-level tablet. Pretty simple, right? Zillow’s already got location-enabled apps on the major mobile platforms. But not so with the Kindle Fire. As a much more stripped-down device, primarily intended for media consumption and shopping, the Kindle Fire doesn’t have GPS capabilities. And even though the Kindle Fire is based on a version of Google’s Android mobile operating system, Amazon has aggressively asserted its independence from Google with the Kindle Fire. That has meant keeping Google Maps out of Amazon’s Android app store, and telling Kindle Fire developers not to include any features based on Google’s Mobile Services—even though that meant the mega-retailer didn’t have its own in-app purchasing system when the device was rolled out. So, to make its maps work on the Kindle Fire’s version of Android, Zillow’s app offers a mobile version of its regular online maps—which are already supplied in almost all cases by Bing. GPS-enabled services are turned off on the Kindle Fire app, but users can still search for an address or location to find homes they’re interested in scoping out. No, getting in as the default mapping service on one app isn’t going to make Bing rocket ahead in market share—the latest figures continue to put Bing-powered search at around 30 percent of the U.S. market. And the search business is still a huge money-loser for Redmond. But it looks like Microsoft can continue getting small wins for its search service when other big tech companies want to play keep-away from Google. They’ll take it.